Erin earned her MSOT at Columbia University in New York and did clinical fieldwork at NYU Langone and Mt Sinai. Her special interests include treatment of neurological conditions affecting daily living, including stroke, TBI, multiple sclerosis, and Parkinson’s disease. Erin is a certified provider of the LSVT Big program for people with Parkinson’s, and believes strongly in its efficacy for addressing movement symptoms and balance. 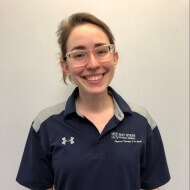 In addition to experience treating neurological disorders, Erin plans to pursue CHT certification and specializes in hand and shoulder injuries that impact musicians. When not at work Erin enjoys playing bass in her bluegrass band and painting from nature. She is currently working on a children’s book about bugs.